Summer vacation is just around the corner and for us that means spending time at the beach. My kids cannot wait to get their toes in the sand and feel the salt water on their skin. Sun, sand and beach is what summer means to us. Spending days at the beach is relaxing and fun but laundry is inevitable. Towls, bathing suits, cover ups, beach bags - it all needs to be washed almost daily. Thankfully, all free clear is helping me keep my kids' sensitive skin safe and still tackles those tough stains like sun tan lotion and food stand stains. 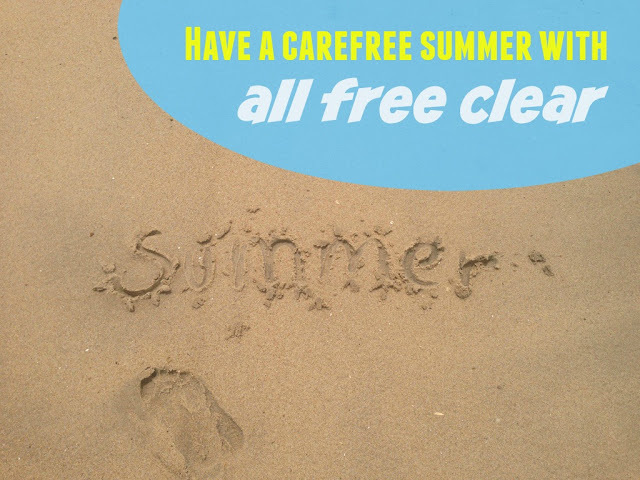 all free clear is gentle enough for my sensitive kids and the #1 recommended detergent brand by Dermatologists, Allergists, and Pediatricians for sensitive skin. Plus, it's safe for use in standard and HE machines. So, if you are taking your all free clear with you to the beach house, you don't have to worry if it's safe to use with the washing machine there! And because I want you to try all® free clear detergent for yourself, I included a link to a $1 coupon! Meet Bear and Floppy from Salina Yoon's new book STORMY NIGHT . When Bear can't sleep on a stormy night, Floppy, his toy bunny, Bear's family, and a few tricks keep Bear from being frightened. Even though Bear is scared of the storm at first, he soon realizes that the storm is over before he knows it, thanks to a familiar song, kiss and tickle. This is a great book to read to kids during a thunderstorm. My kids loved the beautiful illustrations and all the ways Bear's family tries to make him feel better. And don't worry, Bear's frown eventually turns back into a big smile. And for more adventures with Bear and Floppy check out FOUND by Salina Yoon . Lunch had to be fast this morning, since the gloomy weather kept everyone in bed much longer then normal. We went from summer weather and temperatures in the high 80s to rain, thunderstorms and temperatures in the 50s, brrr.